The MPS was designed with the input and suggestions of NAVAIR, U.S Marine Recon units, units of the Army's Special Operations Command, and various United States Special Operations personnel. The MPS slides easily into existing pilot survival knife sheaths. Many backpackers, hikers, mountain climbers and campers have commented that the MPS is the perfect utility knife. The MPS-Ti is made with our special blend of titanium, which has very superior wear resistance and is thru-hardened to Rockwell C 47, while still maintaining its flexibility. This knife will never rust and is non-magnetic. The MPS blade is a smaller version of our MPK model with the same versatile blade belly which makes it an excellent utility and survival knife. The additional spine serrations on the MPS allow for more thumb pressure, grip and control for delicate cutting tasks. The distinctive skeletonized handle fulfills requirements where ultimate light weight and thin profiles are demanded. The MPS-Ti is available in an approximate 10" length, .250" thickness, serrated or plain, with a skeletonized handle and a Kydex sheath. 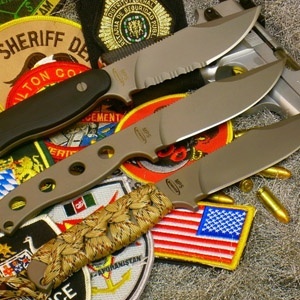 Optional handles include G10 composite material with titanium screws or braided cord wrap in your choice of color (ACU, Black, Blue&Red, Blue, Black&White, Desert Sand, Desert Tan, Bright Green, Multi Camo, Olive, Orange, Red, Red&White, Tan, Woodland Camo, Yellow&Black, or Yellow).